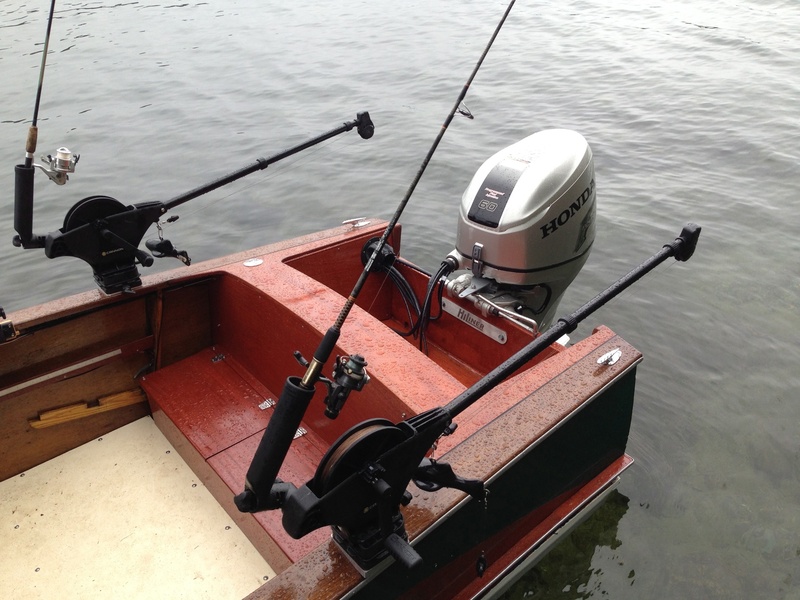 Original 1970 60 hp Evinrude outboard motor. 1970 original Tee Née trailer with new wiring, lights, tires and wheels. Bottom has been completely fiberglassed and and painted. All original interior with cushions. Original canvas helm cover over front seat, that folds into the dashboard. 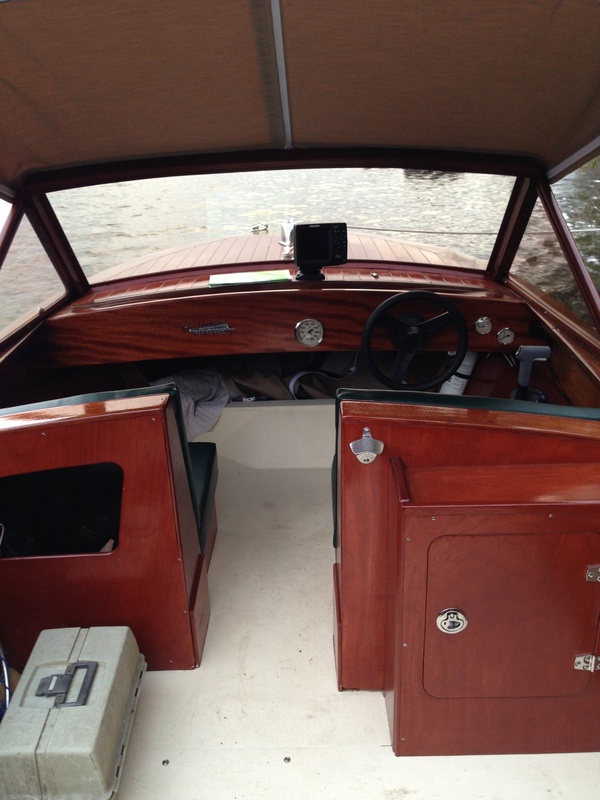 All electric works, speedometer, bow light and anchor light. New steering cable and bilge pump. New full-length custom fit canvas cover for travel, dock and storage. Sorry, no photos in the water yet. This boat looks great. I’m going to check with Finn on the MFG date of his boat. 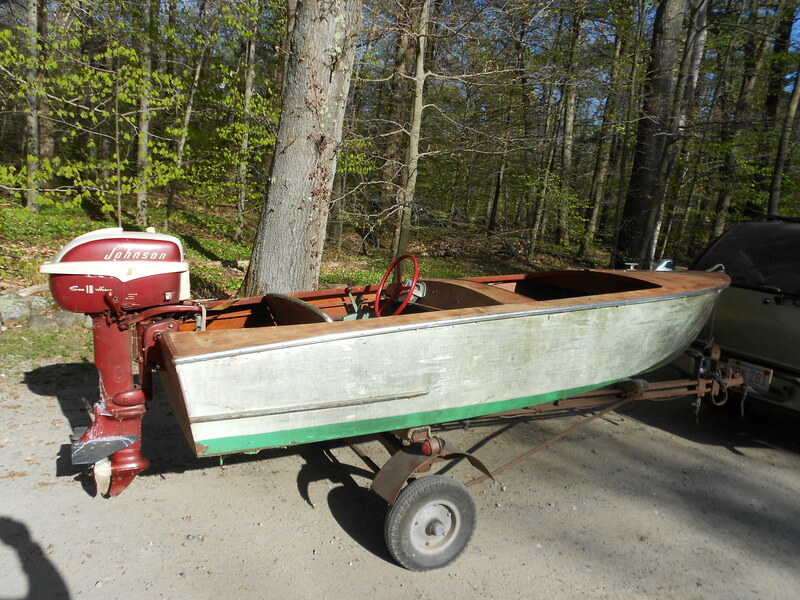 To my knowledge, Hiliner Boat Co. was out of business by 1963. A number of hulls were finished off by Bunny Fernald after this date. The latest date that I had previously seen was 1965. Randy from Amesbury, MA sent over this link to a video of him and his 58 Fleetstar at the 2014 ACBS show in Meredith,NH. Randy appears at the 21:51 mark in the video. He has a great story of how he came to own his boat. Kieth Symmes from Essex, MA sent me the following note and pictures. 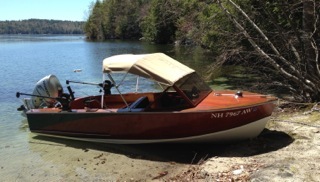 Well the “140” HiLiner is out in the sunshine in Essex, MA for the first time in many years! These will serve as some “before” pictures and obviously I have a lot of work ahead of me, but I am optimistic. 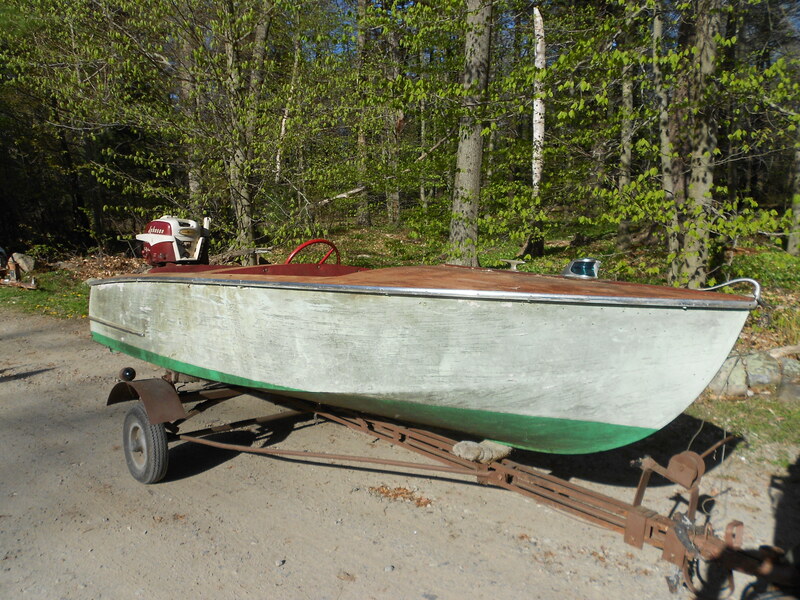 As I had indicated previously, this was my 93 year old father’s boat and he got it from his older sister who had it on the tiny fresh water river up in Amesbury, MA at her camp many many years ago. I had taken most of the hardware off the deck and started sanding there first. I hope to also strip the paint on the sides and if I can, stain that as well. My dad said this pale green was the color is sister had from way back. 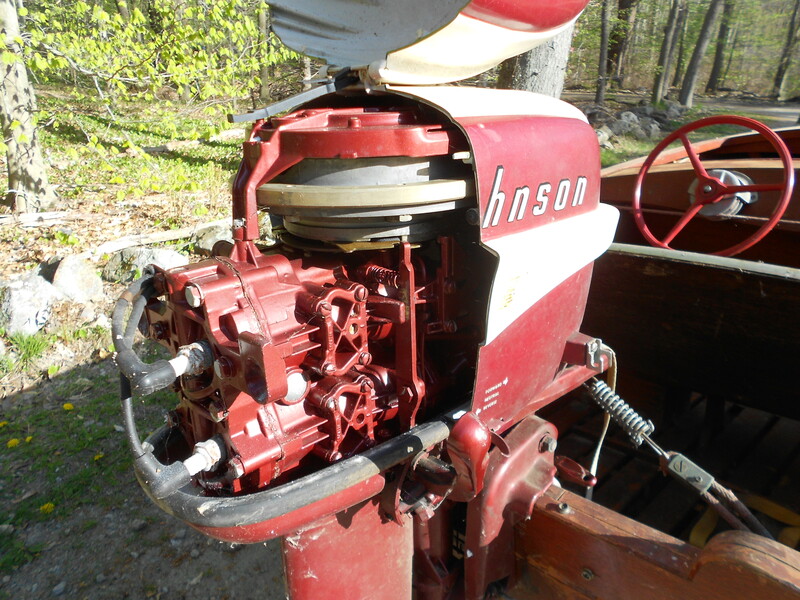 The motor is the original 1957 18 HP Holiday Bronze Johnson which has seen very little use, and the trailer is also a classic. I notice the steering is offset to the port side more than the one shown in the 1955 brochure. I wonder if it was offered in 1956 and 1957 as a special order as this was always represented as a 1957. Notice the red “rope” that does the steering!!! Wish me luck? I’ll need it as I start this project. I also have some vintage pennants to fly from the United Shoe Yacht Club that my mother’s father was active in more than fifty years ago. I also have his vintage paddle and gaff hook to lovingly restore. 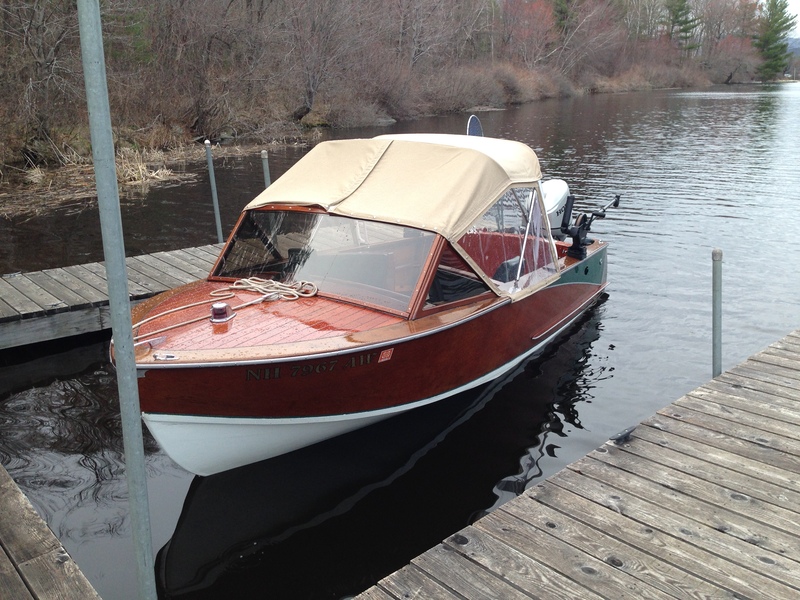 Looking forward to this classic wooden boat being on Chebacco Lake again. 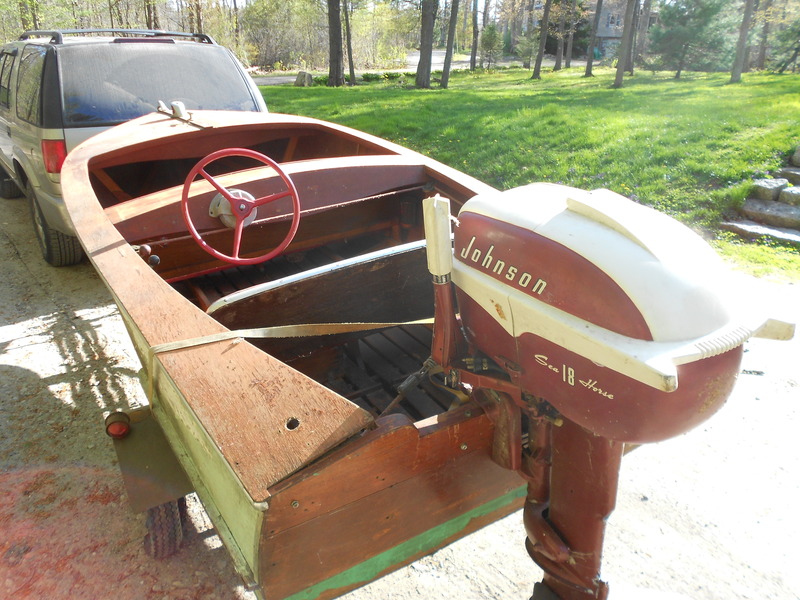 I also have several more vintage green Johnsons tucked away from the 30’s (rope pull 10 HP), 40’s (5 HP), and early 50’s (two 25 HP) in similar condition as we have been here on the lake since 1937. If anyone has pictures or stories that they would like to share, please send them. I received this email from Dan Fitzgerald. When I was little we came home from the July 4th Parade and there was my uncle sitting in a brand new 1956 14′ HiLiner tied to our dock. We lived on Lake Cochituate and no one had anything like this. It had a 30 Johnson and it flew -no one could come near us. It began a life-long passion for boats for me and of course HiLiners always had a special place in my heart. In the early 70’s I bought a 1962 16′ HiLiner with a MERC 700. Just the most perfect package in the world. We loved the boat but time was passing and we succumbed to the beautiful fiberglass boats; eventually ending up with a competition ski boat. But I always missed the HiLiner keeping my eye open for one. I looked for my ’62 HiLiner thirty years later and actually found it. It was a Good news and Bad news scenario. The Good News is that it was restored and is still alive and well. The Bad News is he won’t sell it. But then again that may be a good thing. I also still own a 1965 Glasspar G3 that I bought brand new. 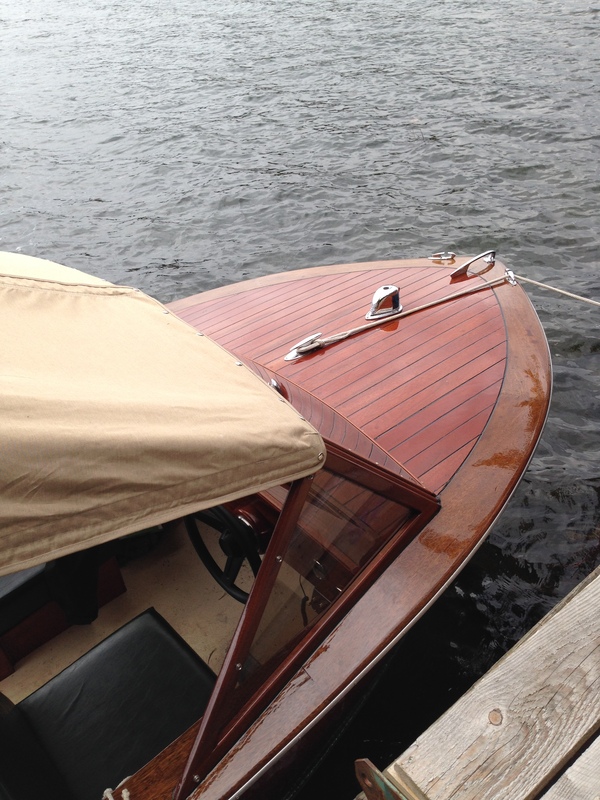 It is fully restored and we use it – it’s a virtual showboat. I have owned lots of boats but never could sell my G3. Thank Goodness. Had I had the room, I never would have let the HiLiner go. Lastly I was so happy to see your website. HiLiners were a step above all the competition. It’s sad we don’t hear much about them anymore but maybe you’ll fix that. Best of luck – wish you the best. 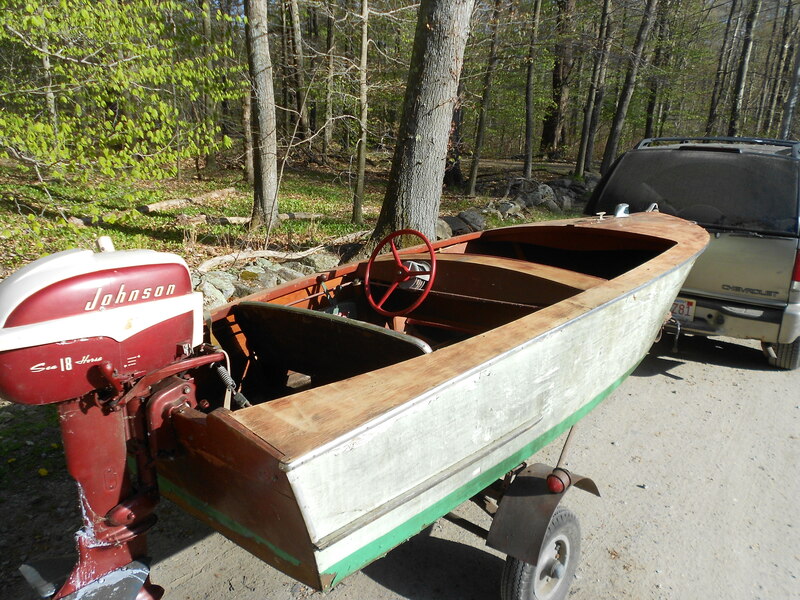 David Miller from Rochester, NH sent along a picture and some great history on his Fleetstar. 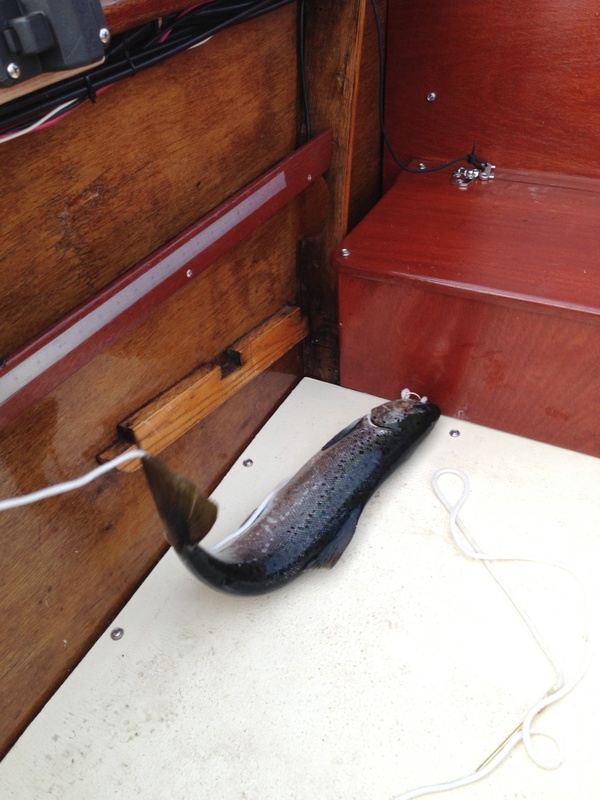 His grandfather, W. Paul Miller, bought the boat from Fernalds Marine in 1957. 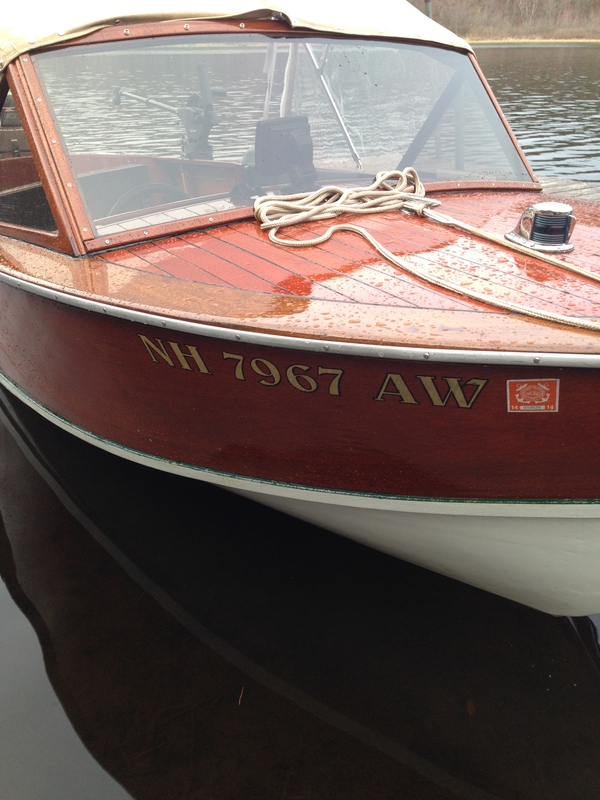 The boat was refinished by Fernalds in the mid 60’s. David still has the receipt from Fernalds and has offered to scan it for us. In the mid 80’s. 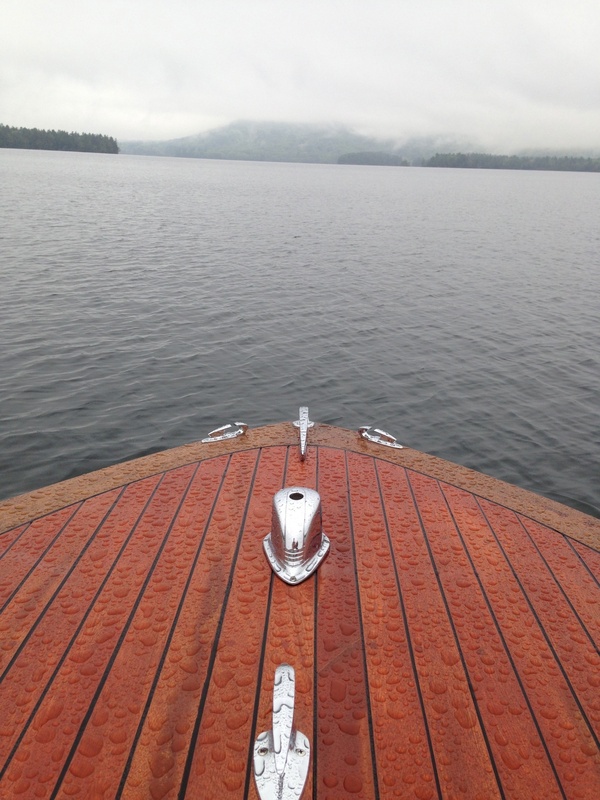 David and his father replaced the Bow Plywood and Mahogany strips. In 1990, Hurricane Gloria ripped off the windshield. 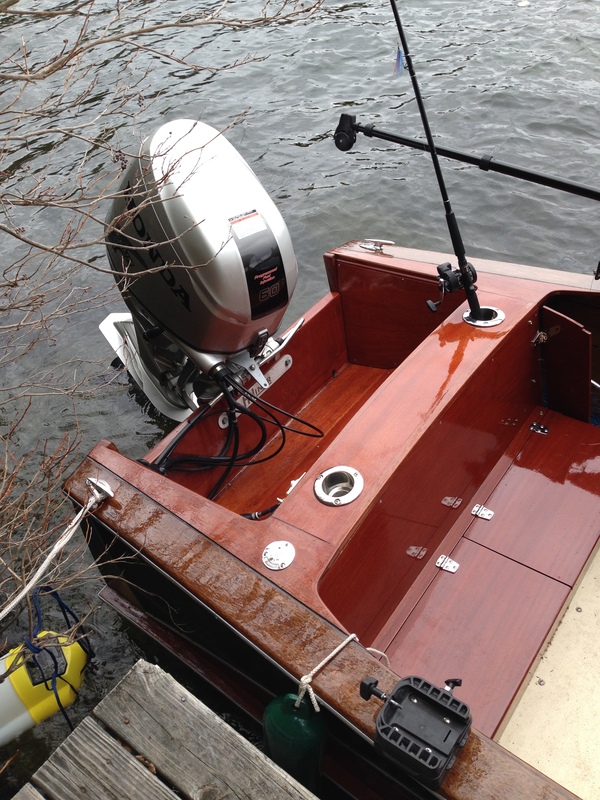 The boat now has a replacement. The picture below was taken in 1988. David is in the boat with his mother, while his sister lounges on the deck. His father took the picture. 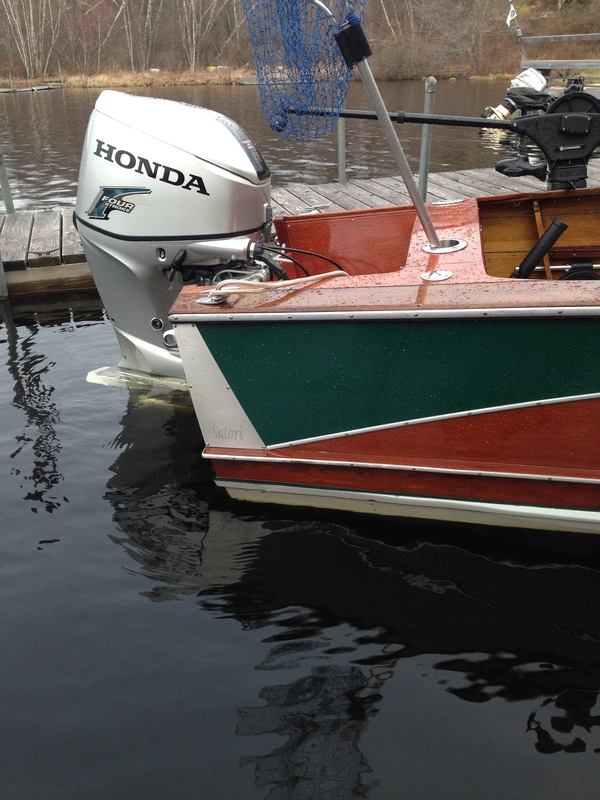 Since starting this site i’ve heard many stories of great family memories that took place with the Hiliner boats. I’m always looking for more stories and pictures to add to the site. 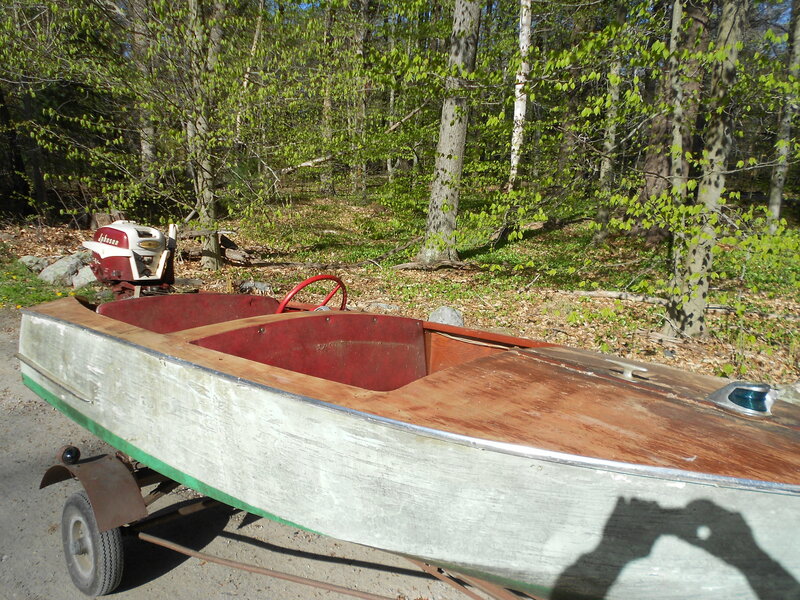 David still owns the boat and uses it regularly on Milton Three Ponds and in Laconia.